Improper wall and ceiling repairs and poor texture matches are the most noticeable errors in building maintenance. 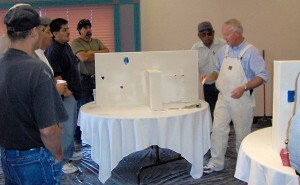 Participants at this “hands-on” workshop will learn the most common types of wall and ceiling maintenance problems that are encountered in Building Facility Maintenance. 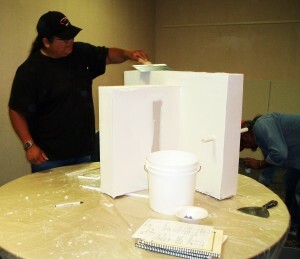 Whether you are rehabilitating housing, doing unit turnovers, processing work orders, or remodeling a house, this workshop offers firsthand learning of the skills needed to drywall, texture, and paint like the professionals. Workshop participants will receive a detailed workbook that explains how to perform drywall maintenance and repair work, which will be theirs to keep for reference later on the job. The workshop leader, who is enormously skilled in the Drywall and Texturing trades, has owned and operated a successful drywall business for more than 40 years. His down-to-earth teaching style and the individual attention that he pays to his workshop participants makes the “hands-on” learning experience easy AND a lot of fun! TSA certificates will be presented to everyone who attends this training. SPECIAL NOTE: Due to the personalized nature of this workshop, we must limit attendance so please pre-register early to ensure your spot at this popular training session.